Many of us subscribe to the New Consciousness idea that what and how we think determines much of what happens to us in life. Lisa Garr had a first-hand opportunity to find out just how true that is. Since then she has been sharing what she learned on several radio shows and on the internet. Now she is making her story available in book form. After suffering a major brain trauma in a biking accident, Garr found herself struggling to recover her ability to speak and remember. She turned to advanced EEG feedback techniques to help her reprogram her brain and restore her functionality. The success of that therapy led her to change her life and devote herself to living fully and helping others to live fully as well. The key to the lessons that she learned is awareness. Becoming aware of our physical experiences, our true potential, the roadblocks to our full functioning, our ability to process stress, and how well we deal with loss are all major aspects of taking control of our destiny and recognizing the opportunities that are available to us. 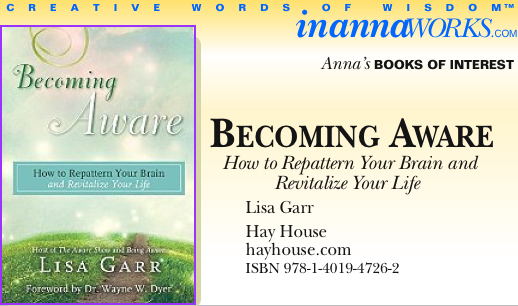 This entry was posted in Anna's Books of Interest, Hay House. Bookmark the permalink.